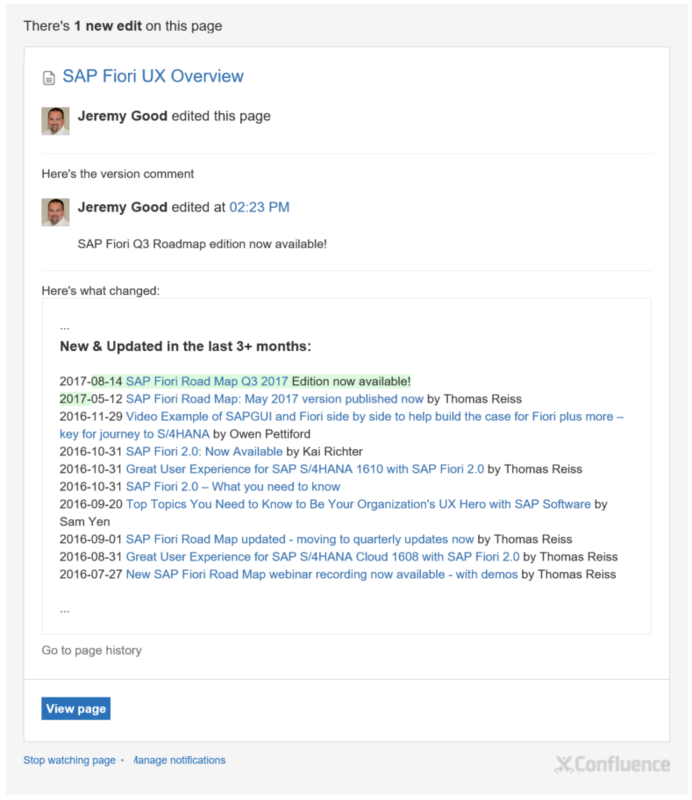 The August update of the SAP Fiori Road Map is available now – but blogs are not the right medium for informing community members about news items, so how will you be able to get notified in the future when new versions of the road map are published? From now on, whenever the SAP Fiori Road Map is updated, a news item will be added to the All Things SAP Fiori page, and also to the SAP Fiori UX Overview page. Both of these pages are wiki pages, which means that you can subscribe to the page and get e-mail notifications whenever the page is updated. In case you’re interested in this quarter’s update of the road map: it gives a holistic overview of SAP’s plans, covering design, technology (including design & development tools) and application road maps, and has been updated in all areas. The SAP S/4HANA section covers 66 roles in SAP S/4HANA Cloud and 106 roles for SAP S/4HANA (on-premise), up from 61 and 105 respectively in the May version. This update now also includes the road maps for the two SAP Fiori for iOS apps for SAP S/4HANA Cloud and on-premise, as well as further improved navigation links, and a more holistic view of the SAP S/4HANA Cloud product compared with previous versions. As before, you will find the SAP CoPilot road map here too. Please note that the SAPUI5 version 1.46 is treated as a “Planned Innovation” in this update, since its planned to be released to customers in mid September. You can also find the road map on www.sap.com/roadmaps under Cross Topics. I’d be interested to hear any feedback you may have to the road map – content, but also format and navigation.